We’re living in a second Golden Age of firearms, especially where handguns are concerned. There’s never been such a wide selection of pistols offering such excellent performance and reliability at modest prices. Thanks to competition and free-market pressures, manufacturers have stepped up their efforts and capability of their stock pistols, which would’ve been nothing short of amazing 30 years ago. However, many professional and civilian shooters don’t seem content to settle on stock performance, no matter how impressive. Today we’ll be discussing the recent rise of the MRDS (Miniature Red Dot Sight) and extensive slide manufacturing on pistols. 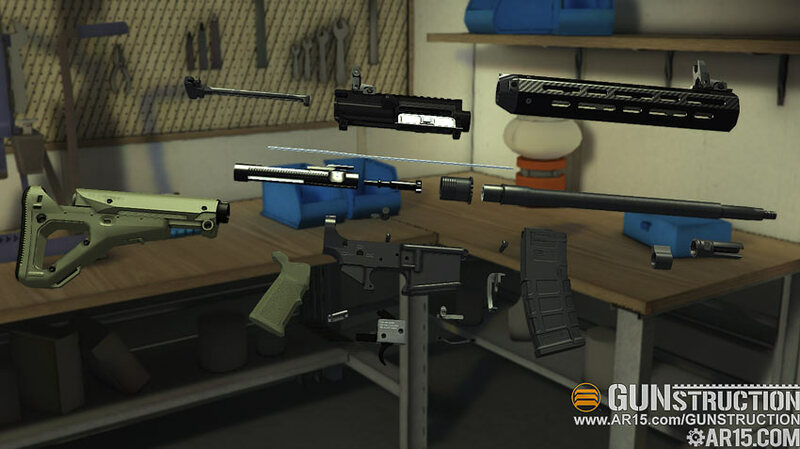 Users have been customizing their weapons since history has been recorded and that includes firearms. All throughout the 20th and 21st centuries, skilled amateur shooters and professional gunsmiths have been tuning up their guns to improve performance and add capability beyond what the designer intended. This includes better triggers, tuned actions, improved control surfaces, greater capacity and anything to help win a fight or take home the gold. Those same enhancements are as valuable today as they were then, but recently we’ve seen a rise of both the miniature red dot sight and extensive slide machining for pistols. Both are extremely trendy in the gun world right now, not to mention controversial and each modification has its share of proponents and detractors. If you take a look at nearly any social media page, you’ll see a seemingly endless parade of semi-auto pistols, all makes and models, that have an MRDS installed. You’ll also see radical, expansive windows cut into the sides and tops of the slide, usually showing off a barrel in a contrasting finish. It’s easy to think these mods represent the pinnacle of handgun enhancement, but do they really? Before judging either of these popular mods, it’s important to consider the context or task that the host pistol will be used in. If the gun is merely a cool toy for weekend blasting or informal competition, go nuts. I don’t want to be the guy to ruin your fun, even if I think your gun is ugly. It’s your nickel, so customize it to your heart’s content. However, if the gun is used for any serious social purpose, meaning defense or duty use, you must understand that both of these modifications have significant sacrifices attached to them. I don’t mean just mean a much lighter wallet either and I’ll explain these sacrifices in detail below. Reliability in a defensive gun is paramount. I want all the performance I can get, but I’ll rarely compromise even an ounce of reliability for a pound of performance. For that reason, I favor mature designs in pistols and optics that, while not cutting edge, have performance parameters that are well understood. With these parameters, I generally know how much I can demand before they fail. I’d rather spend my coin on training and practice to improve performance than on hardware upgrades. You might say I don’t want to be the beta-tester of the Next Big Thing™. Other shooters feel differently; they excitedly adopt any new gun or accessory that can give them an edge and are happy to test, tweak and refine it until they’re either satisfied with it, or prove it unworthy. I’m not knocking them, for without those bolder souls our progress would stagnate. I only make the comparison here so that you may better understand why I advocate the things I do and why you should take the time to understand your priorities before taking the plunge on either of these pricey enhancements. Red dot sights on handguns aren’t a new concept. First appearing in the late 1970’s and early 1980’s in IPSC and USPSA pistol competitions, their advantage was so overwhelming that soon after, there was rarely an open class pistol seen without one. These early red dot sights enabled faster acquisition, greater accuracy, better speed and both-eyes-open target focused shooting. However, the sights were very large and required specialized holsters for the competition pistols they were mounted on. Reliability was also middling and these earlier sights needed frequent replacement. There were few shooters back then who didn’t recognize the performance boost made possible by an RDS. However, their bulk, size and relative fragility precluded them being used on defensive handguns. In fact, red dot sights on rifles were still a fairly new concept at the time and were meeting plenty of resistance. 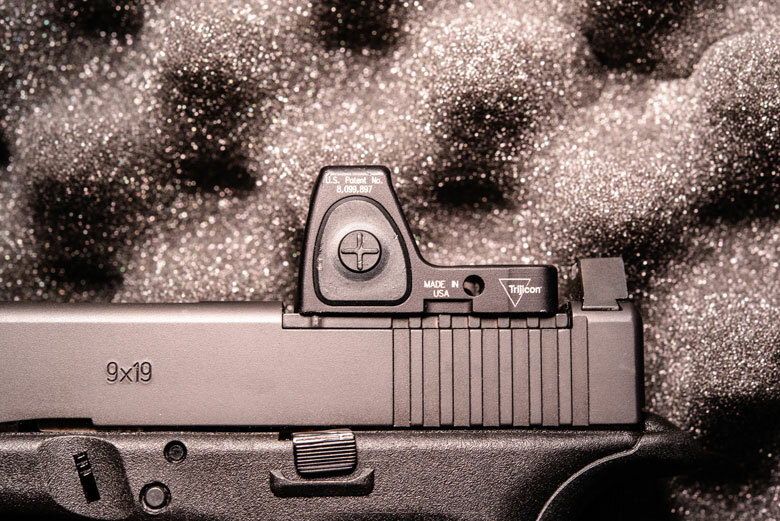 These days, several companies like Trijicon and Leupold have produced featherweight Miniature Red Dot Sights that have far greater durability and battery life than the big tubes mounted to our race guns over 30 years ago. Pistol slides are typically equipped with a Miniature Red Dot Sight either via direct mounting, accomplished by machining a recess and recoil bosses into the slide itself, or by installing a mounting plate in place of the rear sight in the pistol’s dovetail and bolting the optic to that. External “bridge” type mounts are also an option for a few pistols, but as their weight and bulk is a hindrance for many modes of carry, we’ll constrain our discussion simply to slide mounted optics. Since the boom in popularity of such handguns, many major manufacturers like Glock, Smith & Wesson, Walther and F.N. now offer models with factory installed optics directly mounted to the slide. If there was ever a sign that the Miniature Red Dot Sight is here to stay, this is it. Should I Invest in a Miniature Red Dot Sight for My Pistol? 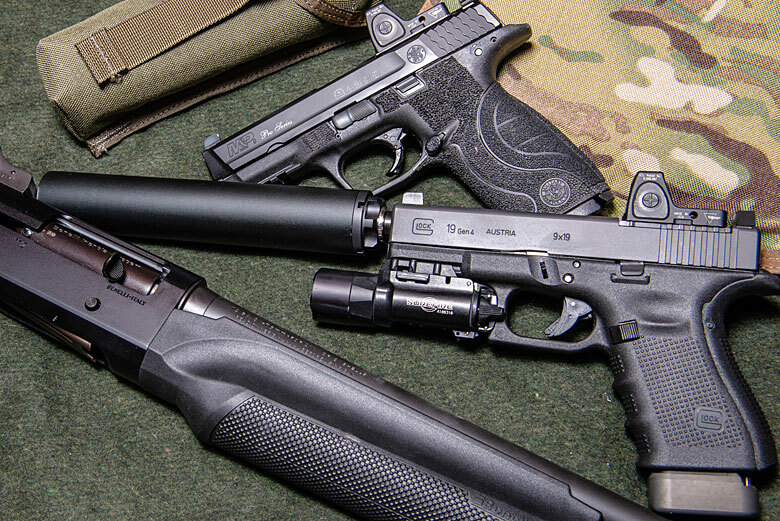 The long answer is “yes,” but the short answer is “it depends.” Optic-equipped pistols offer significant increases in speed and accuracy, just like an optic mounted on a rifle. They’re single focal-band sights that allow focus to remain on the target, not the sight itself. They allow a far better view and awareness of the target, especially a distant small or moving one, compared to iron sights. Shooters with ailing or older eyes will have a much easier time employing an optical sight than irons. All of these attributes make for a significant enhancement in capability compared to iron sighted pistols. 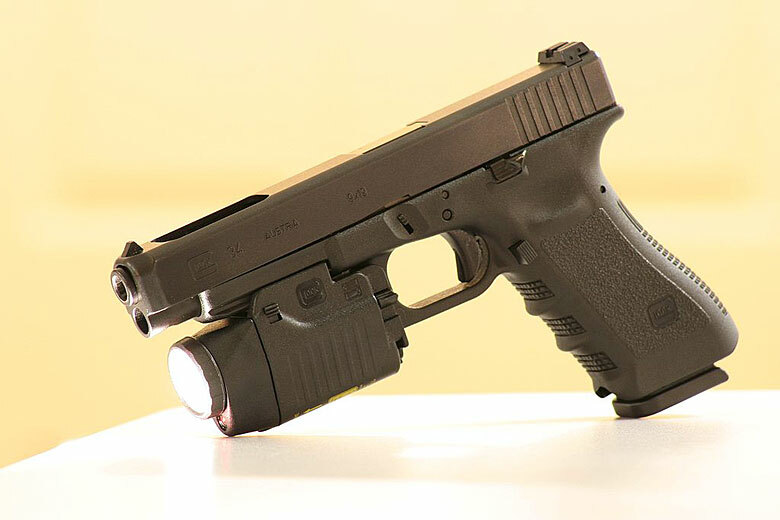 As we move forward, we will be seeing these small optics grow closer and closer to ubiquity on handguns, just like we’ve seen them on long guns. However, there are drawbacks to installing and using a Miniature Red Dot Sight. For starters, costs are considerable. The machining required for direct mounting of a Miniature Red Dot Sight will often run several hundred dollars. This usually includes refinishing, cutting new dovetails for your irons and purchasing suppressor height sights to co-witness with the optic. 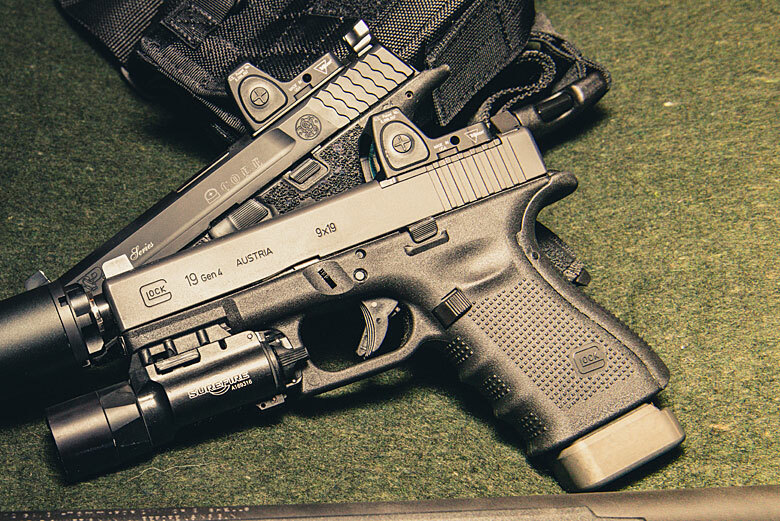 The optics most worthy of consideration for use on a defensive or duty pistol are the Trijicon RMR series and Leupold DeltaPoint series. They’re expensive though, at least $350 and up. All tallied, you’ll be spending at least $600 to pop a dot on your existing slide. That’s the price of a pretty good handgun, or tuition for a multi-day class. The other drawback that’s most significant to me is that you’ll have to undergo the training and practice necessary to get the most out of the optic. Make no mistake, these systems aren’t plug-and-play. You shouldn’t expect to set world records or even beat your own best times as soon as you fire up the dot and click your shot timer. 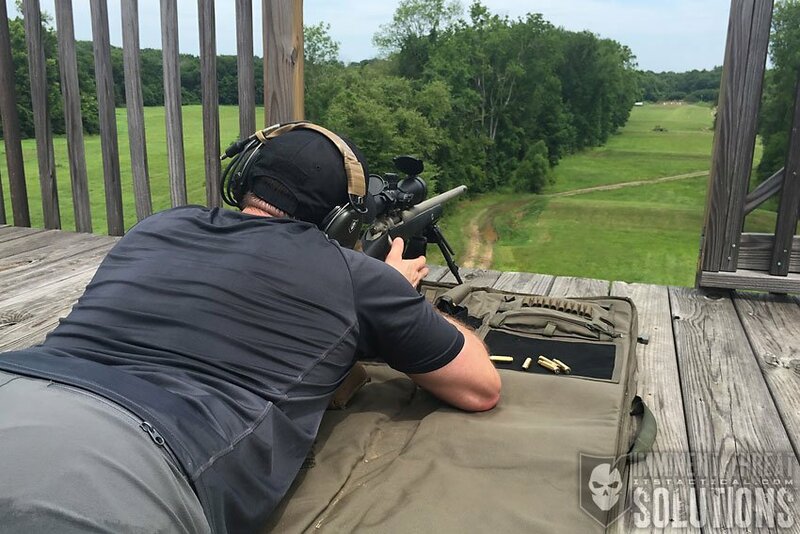 Many professional shooters and trainers, even our current crop that strongly advocate the MRDS report that it takes time and refinement of marksmanship fundamentals to reap the benefits. MRDS’s are unforgiving of poor alignment with the eye due to their extremely small lenses. This results in inexperienced users hunting for the reticle at the end of their presentation and a corresponding reduction in speed. The nature of iron sights, specifically the front sight being visible in our peripheral vision as the pistol is indexed to the target, makes final correction of sight alignment simple, even at speed. In fact, this has resulted in a degree of acceptable “slop” in the presentation of many shooters. It’s this slop that will betray you with an MRDS, resulting in frustration until you correct the deficiency and present the pistol with more consistency. The other major factor affecting a slide-mounted Miniature Red Dot Sight is one of simple durability. While the latest generations of Trijicon and Leupold optics are extremely rugged, these optics still often live short and brutal lives before malfunctioning. On average, service life will be several thousand rounds before servicing or replacement is required. This isn’t a knock against manufacturers per se, as these technologies are still evolving and MRDS’s are subjected to enormous shock stresses when slide mounted. Nevertheless, it will necessitate a dedicated shooter or agency to have multiple optics on hand to ensure any given pistol stays in service. 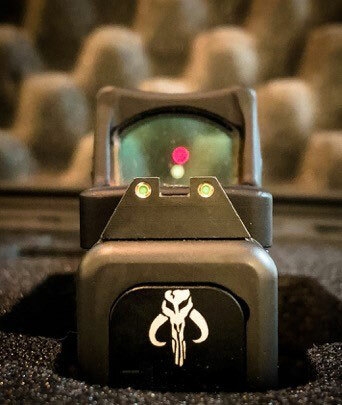 The bottom line is the Miniature Red Dot Sight represents a new paradigm for handgun performance and is the future standard. Costs aside, be honest with yourself if you’re willing to undertake the necessary practice and training to extract the most performance from it. As durability and service life of the optics continue to improve, there will be less and less valid reasons to avoid implementing one. For clarity, the modification I’m referring to is the milling of non-factory holes, windows or other cuts into the side and top surfaces of a handgun slide. I avoid using the terms “ports” and “porting” when describing this modification to avoid confusion with barrel porting, a recoil reducing feature. It’s specifically not cutting additional top or side cocking serrations or texturing into the slide. Those simple, minimally reductive cuts when performed by a competent shop, do little or nothing to affect the structural integrity of the slide and reduce weight minimally. The reasons for executing this modification vary, but traditionally it’s done to reduce the weight and reciprocating mass of the slide, commonly seen on competition guns. This can allow the use of lighter than normal ammo loads in a pistol or merely tune the gun to shoot as flat as possible. Pistols with large brakes or compensators rob the slide of additional energy needed to cycle and this deficit must be made up somewhere. Reducing the mass of the slide is one way to do that. In a competition, anything that results in millisecond gains in performance may be seen as a worthwhile enhancement and competitors will sometimes risk a malfunction or equipment breakage in pursuit of bleeding-edge performance. Distressingly, what I see more and more commonly on some defensive pistols are radical cuts and reductions that border on skeletonizing the slide, seemingly in pursuit of mere aesthetics. In fact, they usually just show off a fancy aftermarket barrel. Windows and cuts of this nature, without extensive tuning of ammunition and spring rates, will certainly negatively affect reliable operation by resulting in higher slide speeds. Compromised structural integrity, in conjunction with greater impact forces acting on the slide, will in turn reduce the service life of the slide at best, or result in outright catastrophic breakage. Note that reputable customizers, like the popular Agency Arms, may cut conservative, small windows in a slide to offset the added weight of an MRDS and lost recoil impulse from a compensator. Their guns are typically very reliable and in use with several prominent trainers in the gunsphere, Aaron Cowan of Sage Dynamics is among them. Another common gripe or misgiving I see is that the additional openings into the pistol will allow grit and dirt to more easily foul the action. This is true on its face, but I’m not certain this is the most prominent critique to level against this modification. The Beretta 92/M9 guns feature a slide that’s as skeletonized as you can make it, while still calling it a slide and (crappy magazines notwithstanding) it enjoys a reputation as a reliable pistol in harsh environments. 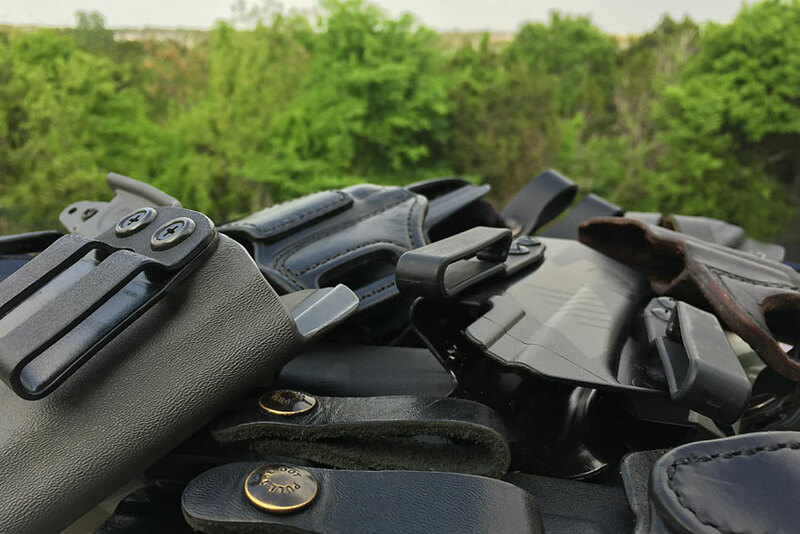 The Glock 34 and 35, both popular duty pistols, are other factory guns with a large opening in the top of the slide, specifically to reduce the weight of their long slides. Both of those guns are factory designed with opened slides and I think it proves the point that slide window reliability isn’t affected much by dust or grit. Are Slide Cuts Ok for a Defensive Pistol? Speaking broadly, I would say no, I don’t recommend them. Though very conservative ones as mentioned above may be ok if done for a good reason. Most times though, the ramifications of adversely impacting the cycle of operations and negatively affecting durability of the slide are too great. It’s easy to forget that pistols are a system, one that’s designed from the factory to run well with each component functioning within a fairly tight set of parameters; the weight of the slide obviously being one of them. When the mass of the slide is drastically reduced, you’ll be forced to change a host of other factors to accommodate it and soon you’re tinkering with all manner of things to try and keep the gun running properly. 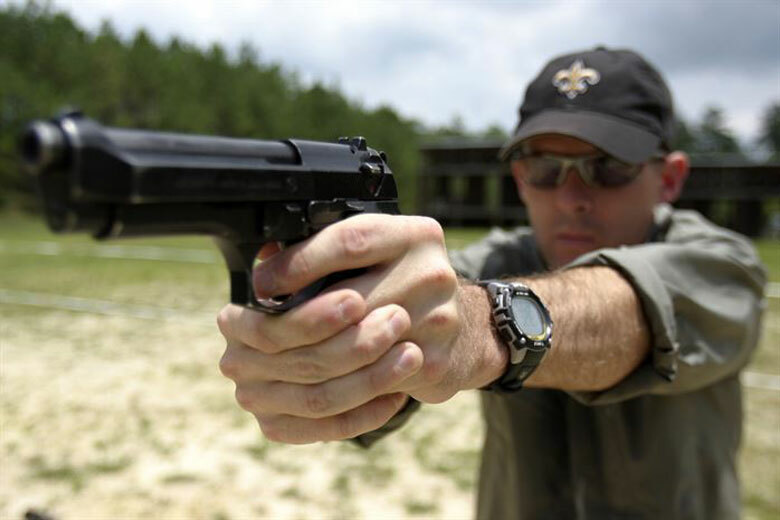 For a defensive pistol, aesthetics should be last on your list of considerations. If looking to this modification to help reduce perceived recoil or help the gun shoot flat, it’s foolish to seek such an extreme, permanent modification for such a small benefit. 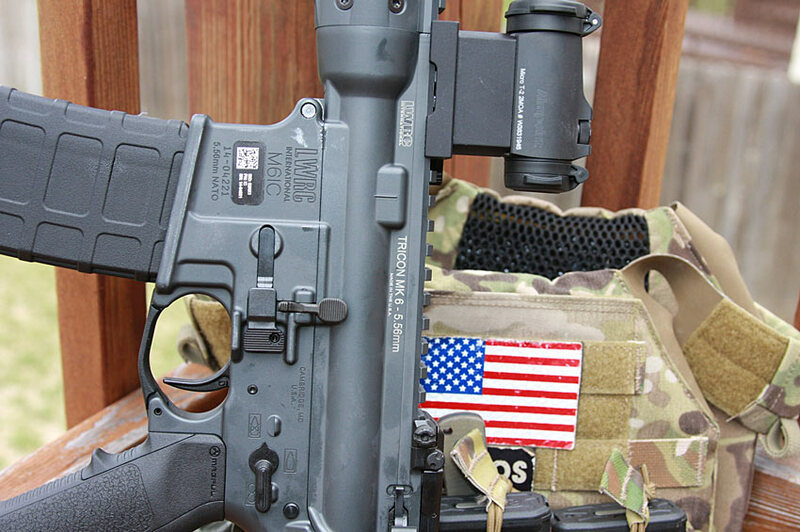 Wrapping it all up, for a duty or defensive pistol, a Miniature Red Dot Sight is a fine investment, both in time and funds. However, I’d recommend saving the extensive cutting on your slide for your gaming guns. Photography by Ben Stephens of One Seven Photography.